Statistics shows that a child dies of hunger every six seconds. You can do something about this. Why not walk the world? simultaneously held in 77 countries, the Philippines included. children all over the world and generate funds to feed these children. Mark your calendars on June 07, 2009, 6AM at Roxas Boulevard. Your contribution of Php 150.00 will go a long way in helping the school children in the conflict-ridden areas of North Cotabato and Sultan Kudarat in Mindanao. 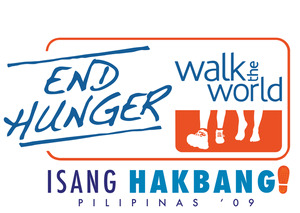 Registered participants will also get the Isang Hakbang t-shirt, bandanna, direct mailer and a Certificate of Donation from the UN World Food Programme. Let us end world hunger, one step at a time.